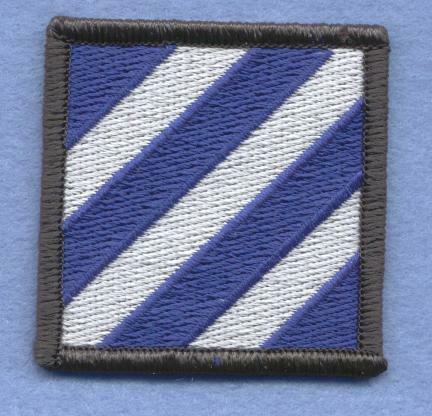 This is a current issue shoulder patch for the 3rd Division. The package that these came from is marked 5/96. The 3rd Division is known as- THE ROCK of the MARNE. BATTLE CREDITS: WORLD WAR I- AISNE, CHAMPANGE, MARNE, ST. MIHIEL, MEUSE-ARGONNE; Medals of Honor- 2 WORLD WAR II- ALGERIA - FRENCH MOROCCO, TUNISIA, SICILY, NAPLES -FOGGIA, ANZIO, ROME - ARNO, SOUTHERN FRANCE, ARDENNES, AISACE, RHINELAND, CENTRAL EUROPE; Medals of Honor-37 KOREAN WAR- CCF INTERVENTION, 1ST UN COUNTEROFFENSIVE, CCF SPRING OFFENSIVE, UN SUMMER -FALL OFFENSIVE, 2ND KOREAN WINTER, KOREA SUMMER - FALL 1952, 3RD KOREAN WINTER, KOREA SUMMER - FALL 1953; Medals of Honor-11 PERSIAN GULF WAR- DEFENSE OF SAUDI ARABIA, LIBERATION AND DEFENSE OF KUWAIT OPERATION IRAQI FREEDOM PEACEKEEPING SERVICE- GERMANY, BOSNIA. 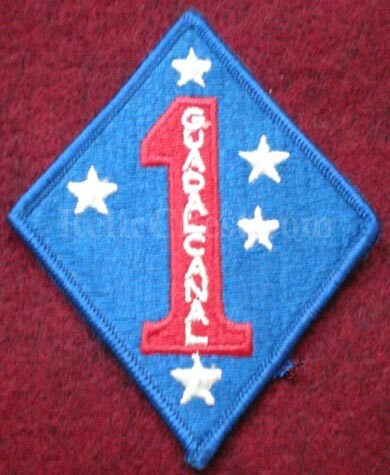 This is a 1st Marine Division (Guadalcanal) patch. Full color with sewn edges and coated backing. 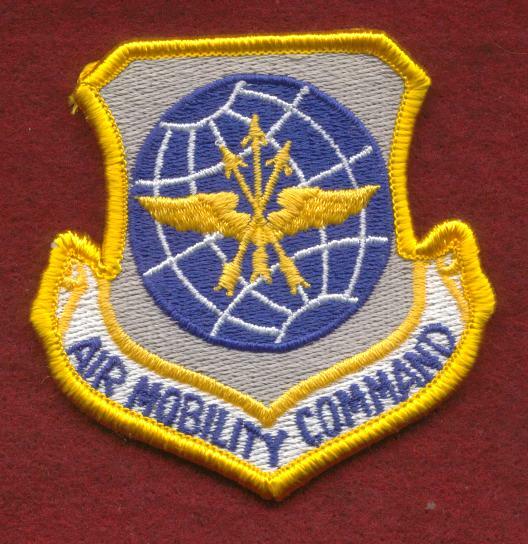 This is a new, current issue Air Mobility Command patch. It has velcro sewn on the back to allow for placement on a flightsuit. The Air Mobility Command was formed from elements of the Stratigic Air Command and the Military Airlift Command on June 1, 1992. It is the lead command for airlift and air refueling and provides operational guidance to other commands. Their primary mission is providing air mobility for wartime operations. 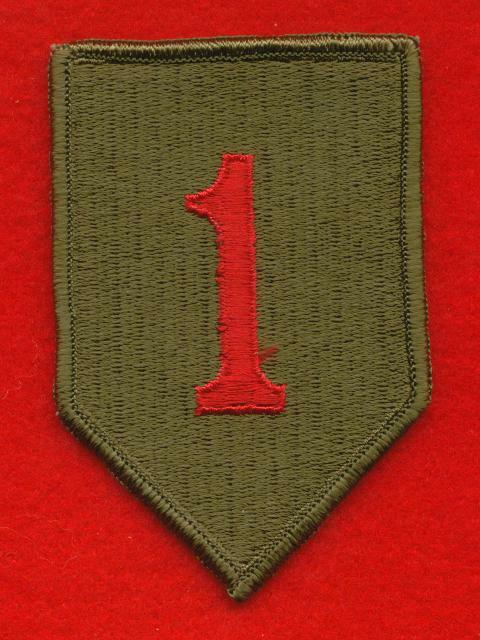 This is a current issue 1st Division shoulder patch. The 1st division was organized in May of 1917. The first American shell fired at the enemy actually came from a 1st Division gun on 10-23-17. They saw quite a bit of action during WWI and boasted 5 Medal of Honor recipients at the end of WWI. The 1st Division landed on the coast of Algeria on 11-18-42. The division later saw action in Oran, Tunisia, Sicily, Omaha Beach, Belgium, Remagen, and Aachen. The Division boasted 16 Medal of Honor recipients at the end of WWII. In Vietnam the 1st Division saw combat in various places to include Bien Hoa. The Division was awarded a Meritorious Unit Commendation and they boasted 11 Medal of Honor recipients. The first Division also saw action in Iraq during Desert Storm and more recently Enduring Freedom. They also served in Bosnia. This Division is a hard charging group. They have been selected to spearhead many actions in which the United States has been involved. This is a current issue airborne tab. It would be a perfect replacement if you are missing one for your unit patch. I have more than one of these. It has a black background with gold lettering. It measures approximately 1/2 inch by 2 1/2 inches. Please email to check on availability and shipping costs. This is a mint patch from the BOSNIA / SERBIA conflict. 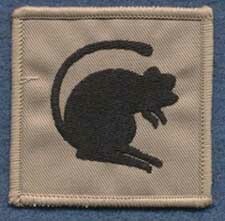 Shown is an upright red Jerboa (or Desert Rat) outlined in white thread on a black twill background.This represented one of the Desert Rat Divisions in the Balkans. This patch measures approximately 2 x 2 3/8 inches. This is an early design of the British Desert Rat insignia used during the 1991 Gulf War. 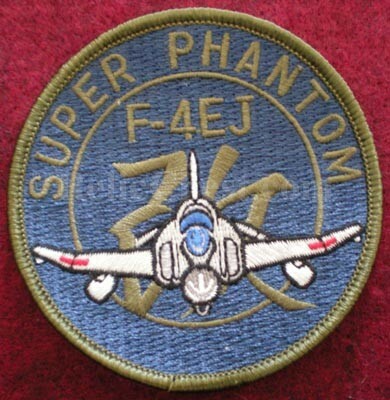 The Ministry of Defense recalled these patches at the end of the conflict. That is why you do not see many floating around out there.These patches contain a black Jerboa (Desert Rat) on more of a pinkish colored background, as opposed to the later issues tan background. This patch was removed from a desert combat jacket, but remains in almost mint condition. Now is your opportunity to get your hands on a rare patch from the 1991 Gulf War. This patch measures approximately 2 1/4 x 2 5/8 inches. U. S. Shipping- Insured Priority Mail on this item would be $6.25. First Class shipping is also available at $.41 for uninsured or $2.00 insured. Email me for a quote. If ordering multiple items, the total weight and value of the combined items in the package will determine the postage. This is a mint patch from the GULF WAR. The first pattern patch, issued around the beginning of the 1991 Gulf War, had more of a pinkish colored background. 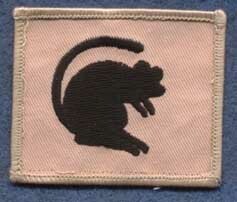 That particular patch was recalled by the Ministry of Defense and replaced with this one.This shows a crouching black Jerboa (or Desert Rat) on a tan colored twill background.This represented one of the Desert Rat Divisions involved in the conflict. The patch measures approximately 2 1/4 x 2 1/4 inches. U. S. Shipping- Insured Priority Mail on this item would be $6.25. First Class shipping is also available at $.41 for uninsured or $2.00 insured. Email me for a quote. If ordering multiple items, the total weight and value of the combined items in the package will determine the postage. This is the standard size flight suit patch measuring 3 inches by 3 inches (at it's widest points). I would say that this one is nearly mint. The Strategic Air Command (SAC) was formed on March 21, 1946. It remained active throughout the Cold War and was disbanded on June 1, 1992. SAC items are highly collectable, so get one now. Own a piece of Cold War history. 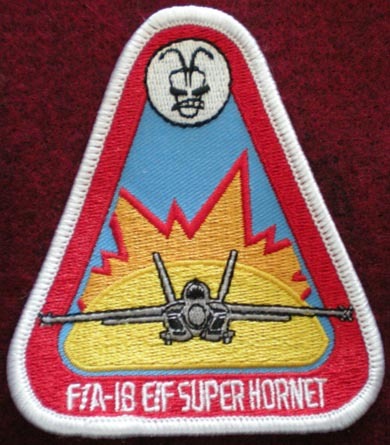 U. S.
This is a nice unofficial patch for the F/A-18 E/F Super Hornet. Please email me for availability and shipping costs. 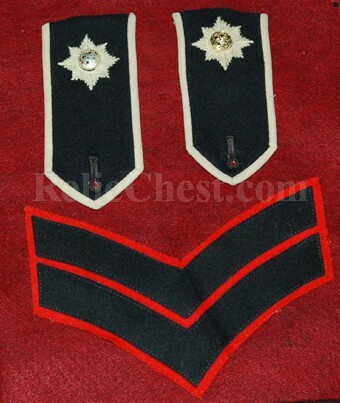 Listed here is a set consisting of two sew in style epaulets and one corporal chevron from a Queen's Guard uniform. It appears that these were taken off of a uniform .